Owner lost while planting raised vegetable garden, plants, and trees. Dug up a few of the plants and went thru some of the mulch without any luck. Went over his garden first and managed to find his pocket knife he had lost. Started going around the trees he had planted hoping he hadn’t lost it in the bottom of the hole. Luckily we had a signal around the first tree down about two inches in the mulch. This was one of the trees he had pulled the mulch back and had dug the tree up to search. Search took about 20 minutes. 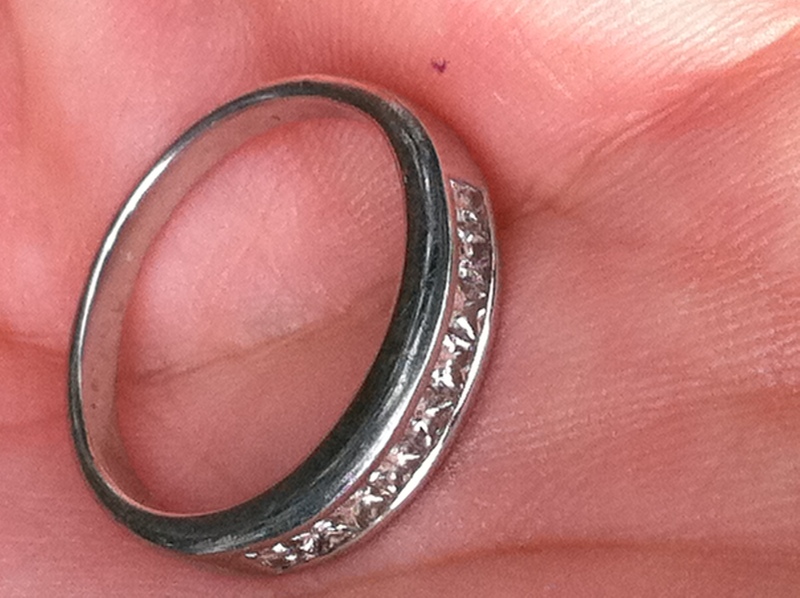 Sunday morning, I noticed an ad on Craigslist for a wedding ring that was lost in a local park. I contacted the person and arranged a meeting that afternoon (besides it was going to get me out of mowing the lawn) I arrived at the park a little early and managed to find 16 cents, two bottle caps, and a couple of the ever present pull-tabs. Shortly thereafter I met Paula and her husband and got into the details of what happened. She took off her engagement ring and put that in her pocket but left her wedding band on she put on a baseball glove to join a game of catch. After playing catch for a bit they began heading back to their car. 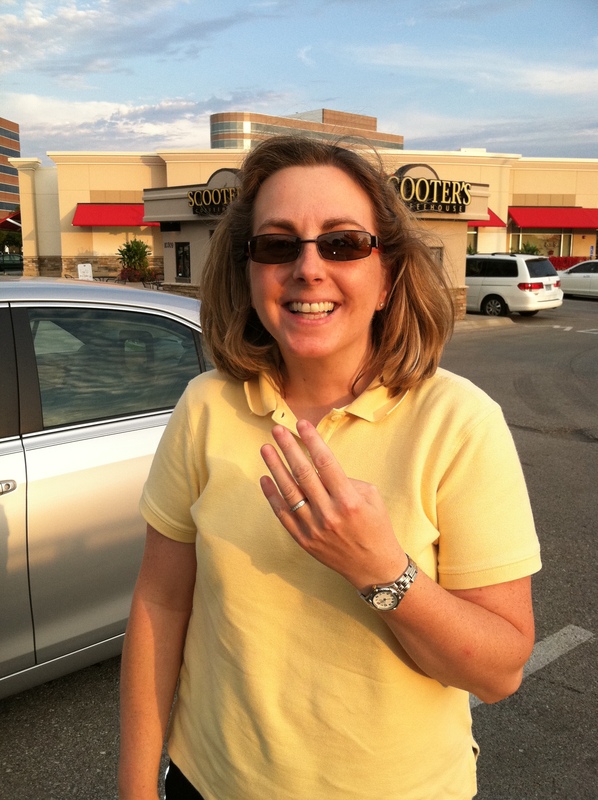 She pulled the glove off and retrieved her engagement ring from her pocket, that’s when she noticed that her wedding band was no longer on her finger. She showed me the general area where she thought she had pulled the glove off on the way back to the car. I set up a couple of stakes to mark of that area and begin searching. Shortly after I started, she and her husband begin intently looking at the area where she was standing playing catch. She felt that it may have been more likely that she dropped it anywhere from there towards where I was searching. I shifted my focus to where she was standing while playing catch. Three or so hours of searching for turned up nothing. Paula and her husband had to leave a little earlier to drop some relatives at the airport, so I sent her a text to let her know that I hadn’t found anything but I wasn’t giving up. Two days later afforded, about an hour to search after work on my way to get my wife. I changed my focus back to the original area and begin a grid search. I had roughly 10 minutes left before I had to get my wife and decided to head for the car. I was about 15 feet from the car when I had a solid signal on top of the ground. Stuck the pin-pointer in the grass and had a sold tone, pulled back the grass to reveal a nice platinum band with diamonds. I immediately took a picture with my phone and sent her a text…..”I hope this looks familiar.” Shortly after, I received a phone call from a very excited Paula…..she couldn’t believe that I had found it. We made arrangements to meet Tuesday evening after work. He was headed to PA on Weds and then out of the country for several weeks. It was a fairly small search, 15 x 15, in one corner of a roped off swimming area. After going over that area pretty well, for about an hour, we started to expand the search. Shortly after that, I had a good signal in roughly 4 feet of water. Using a homemade digging tool with a mesh bag attached, I raked the bottom and pulled it up out of the water. There in the bottom of the bag was a ring. I swung it over to him and asked him “What does that look like to you? He didn’t see it at first, but when he did, he gave me a look of disbelief with a side of grin. He reached in, pulled it out, and promptly put it back on his finger. I’m pretty sure he made a phone call to his wife shortly after we parted ways.